And fuel suppliers can get hot under the collar when temperatures turn cold at the wholesale rack. Here’s some science to start us off: Temperature makes fuel volumes fluctuate, contracting or expanding when the mercury drops below or climbs above 60 degrees Fahrenheit at the rack. Here’s a 100% fake example to drive this point home: Imagine 1,000 gallons of gasoline was sitting in a swimming pool on Valentines Day outside Columbus, Ohio. Fast forward to the 4th of July and there would actually be more gasoline in that pool. The change in temperature alone swells the volume. But fuel doesn’t just hang out in a kiddie pool at a rack. It gets put in a truck and delivered to a customer, who then puts it into temperature-controlled storage. This piece of the distribution chain adds another layer to fuel temperature correction. 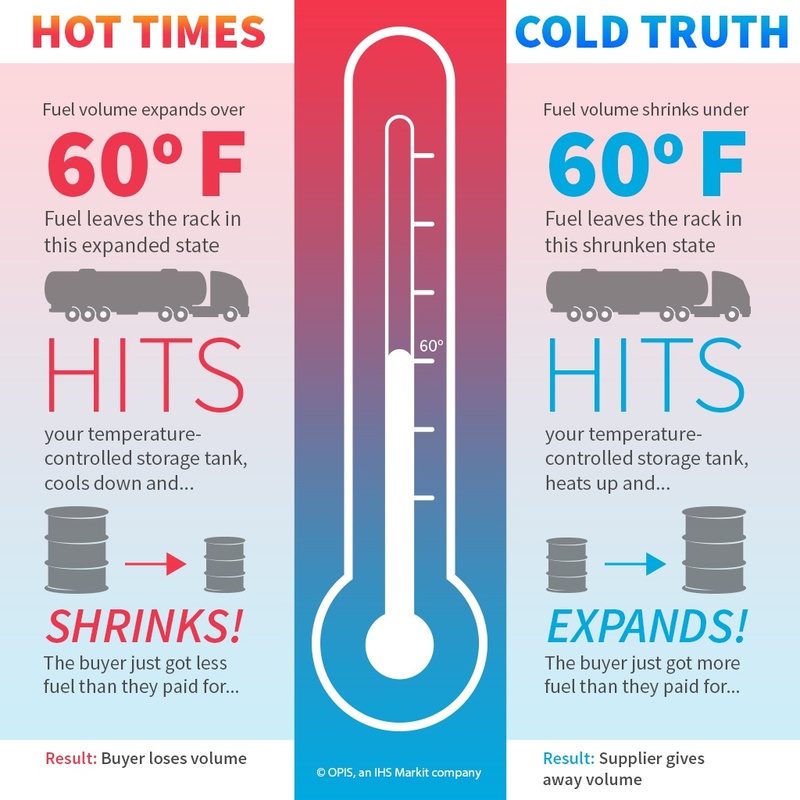 The gallons a supplier agrees to sell on frigid January nights or the dog days of August change in volume once they exit a truck and are deposited into a customer's insulated tank. That’s because they leave outside-air temperature and heat up or cool down in storage. So, in the winter, the end result is that suppliers wind up delivering more fuel than they were contracted to provide to their customers, which has ramifications on the way the market buys and sells gasoline, diesel and biodiesel blends. The fuel that is delivered from the rack by a supplier is known as the GROSS amount. The fuel that is received into a buyer's tank is what is called the NET amount. In other words, the gross amount of fuel is what leaves the rack in a truck and is subject to fluctuations in volume due to temperatures above or below 60 degrees Fahrenheit. The net amount of fuel is what is actually received by a customer once all is said and done. In modern practice, the industry adjusts gross amounts up or down using thermodynamic temperature-correction measurements to determine the accurate net amount received. But How Do You Price It? As you can see from the graphic above, each temperature scenario has its dominant winners and losers. Colder climates tend to put suppliers at a greater disadvantage because they are giving away net gallons. A hotter region sees buyers netting less fuel than they contracted to receive. In light of this, the industry has gravitated toward gross or net billing to reflect prevailing climates. In some cases, states have mandated one practice over another. The states with gross volume mandates are typically in the North. Southern states typically adjust and bill on net gallons received. Fuel is distributed daily at nearly 400 wholesale rack markets across the United States. Supplier prices at those racks move up or down each day at around 6pm, generally based on the movements of the spot market. Billions of gallons of gasoline, diesel and biodiesel blends transact on contracts referencing OPIS rack benchmarks, which is why this PRA realized that it needed to give the industry a mechanism for creating formula deals that accommodate temperature shifts. Reached out to the industry and identified the key markets where temperature fluctuations were creating difficulties in doing business at the rack. Used prior-day high and low regional temperatures, along with the OPIS Gross Contract Averages, to develop a methodology that would accurately factor temperature change into rack deals. To explore our methodology in depth, please click here. Result: A proxy for the amount that would be needed to be added or subtracted from the OPIS benchmark rack price, if the temperature was 60 degrees, to account for product expansion or shrinkage. Temperature correction assessments are available in 34 states that OPIS' industry canvass deemed were most vulnerable to temperature correction issues. These prices can be tracked daily in the OPIS Temperature Correction Assessment Report. Seasonal trends take their toll on spot gasoline and diesel fuel prices, directly influencing what wholesale customers will pay. The OPIS Mobile Spot Ticker connects you to spot market trades all day, wherever you are, so you can always anticipate 6pm rack moves.